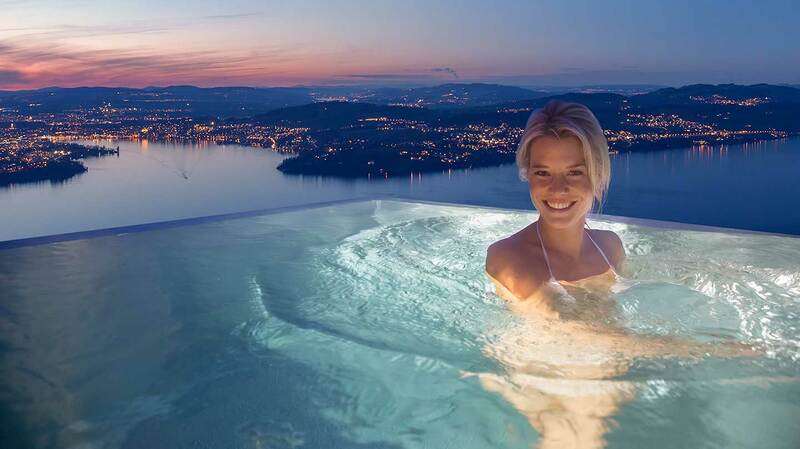 The Bürgenstock is a legendary Swiss resort perched high on a cliff 500m above Lake Lucerne. 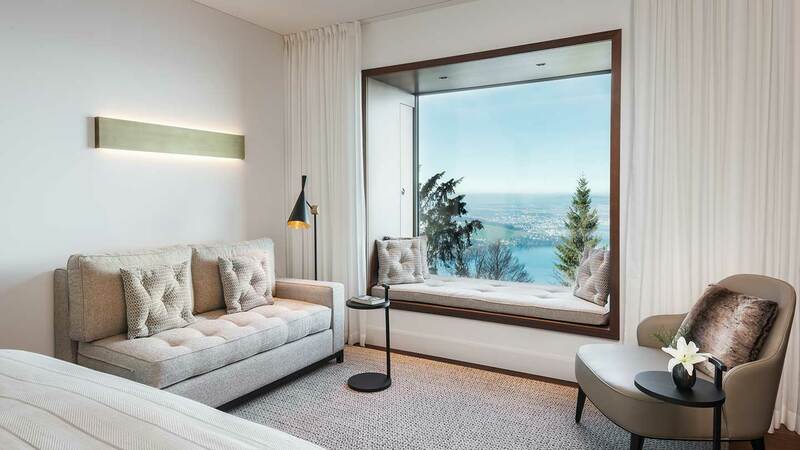 There are four hotels, but we’re here to review the newest two: the Bürgenstock and its Alpine Spa are dramatically modern, while the Waldhotel wellbeing centre is a nine-storey eco lodge designed by award-winning Italian architect Matteo Thun. After a quick flight from London and a soothing train journey though mountains from Geneva, we arrived in Lucerne – think Gothic spires and romantic Belle Epoque buildings. From here, board the Bürgenstock’s boat and glide across the lake fringed with forests and snowcapped Alpine foothills. Hop into the red funicular – a cross between a train and cable car – and trundle up though tall pines high above the water to the hotel lobby: a magical way to arrive. Hollywood Pool, now listed, and pose on the panoramic sundeck. Our bedroom in the Bürgenstock was chic, neutral and minimalist with its own glassencased fire. However, your eye is drawn to the glass fourth wall, filled with sky and scenery. Wallow in your sunken bath or recline on your window seat and gaze at clouds drifting over the glinting lake. At night you can see the twinkling lights of Lucerne across the water. Lake Lucerne isn’t just a pretty face. Thanks to innovative engineering, the resort uses it as an essential resource for generating electricity and cooling the aircon. Much of the new resort was built using excavated material; wood used in the rebuild came from the forest. 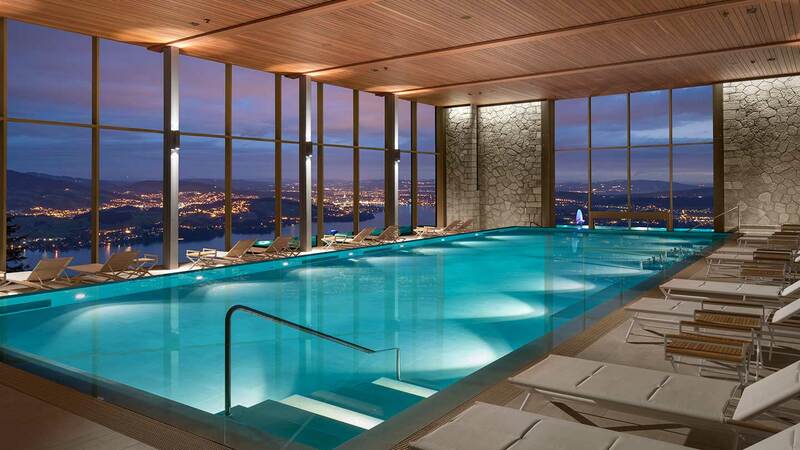 You will be happy to know that the spa pools are filled with lake water, too. From its lofty position, the 17m swimming pool is encased in high-ceilinged glass, filled with ever-changing sky, lake and mountains that reflect onto the pool’s surface. From here, swim though doors to the L-shaped outdoor pool, bathe in the warm water with its various bubble-jet stations and feel the fresh air on your face; its infinity edge appears to spill into the lake below. Head down steps by a dramatic wall of water to a spacious and serene area; its glass sides bringing the beautiful outdoors in. 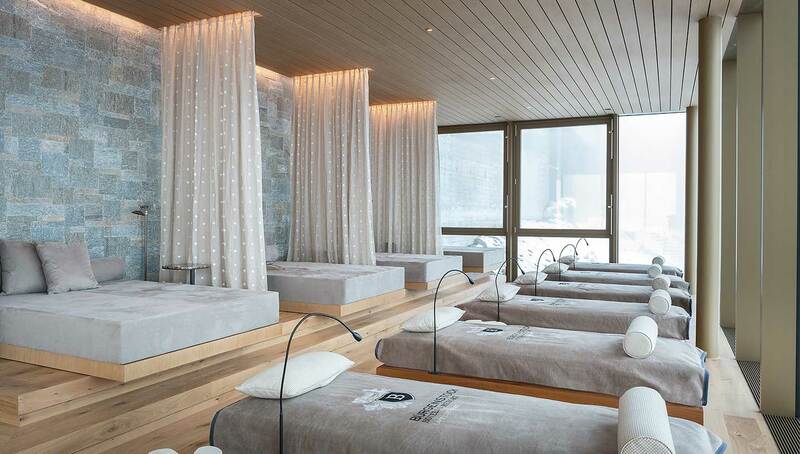 Here you’ll find saunas, steam rooms and baths – too many to list. 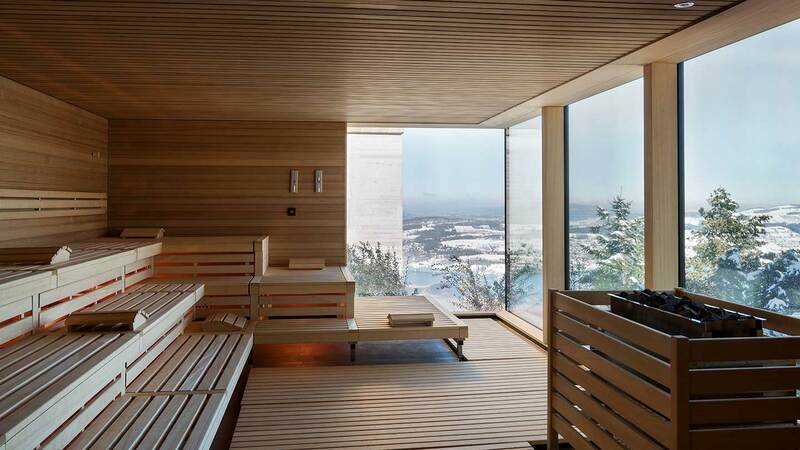 The highlight for us was heating up in the panoramic sauna (the view obliges you stay longer), then popping outside to dunk in the brisk lake water eco-pool – freezing, but what a buzz. We also blissed out in the salt-water floatation pool and nearly fell asleep in our sound pod recliners as they vibrated to soothing music. If you want your relaxation rooms to look like chic Penthouse suites – with cosy fires, water beds, plush sofas and glass walls with todie- for views – then you’re in luck. The Waldhotel is a wellness clinic, with on-call doctors for patients in recovery and medi-spa treatments for those on a wellness retreat – we saw a certain Vogue editor trying the anti-ageing package. The spa here is small but exclusive, with gleaming indoor and outdoor pools and mountain views. They also have a cryogenic chamber, which is supposed to freeze the years off you. The Verbena restaurant here offers an innovative, healthy and delicious menu for all to enjoy, as well as colour-coded diet plans. 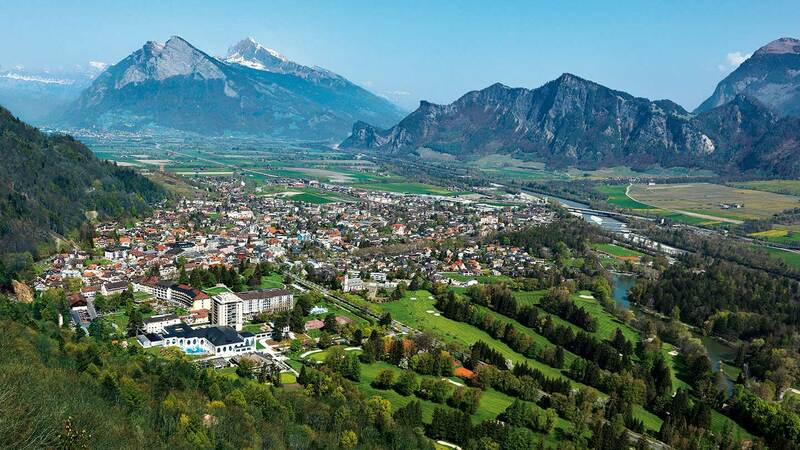 We had two very different treatments: a relaxing yet deep massage at the more decadent Alpine Spa, and a targeted facial at the Waldhotel. 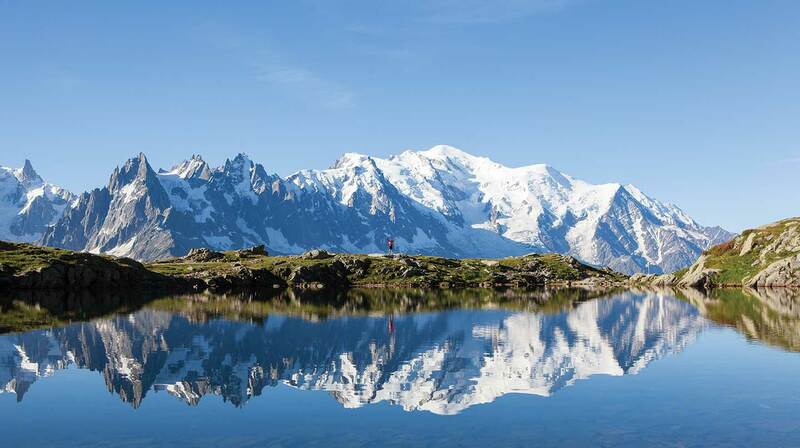 Both had austere, white treatment rooms but with glass walls framing Alpine scenes. 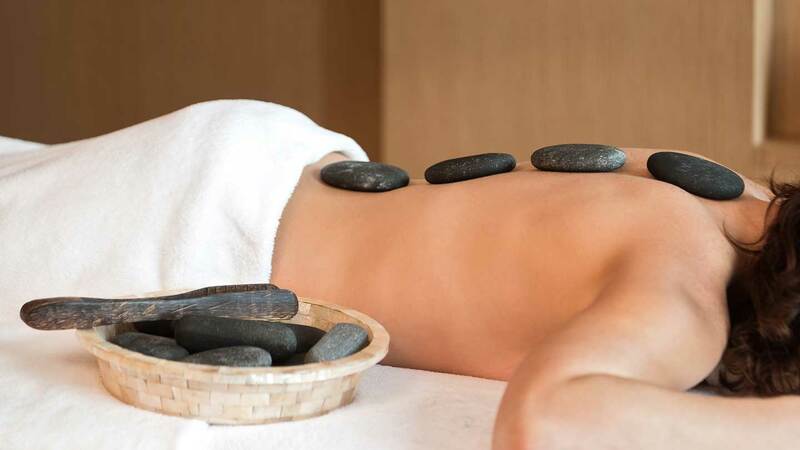 My massage was the perfect indulgence after my journey – knots simply melted away. 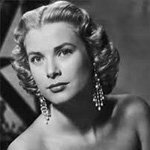 My 50-minute Oxygen facial was performed by a trained dermatologist and used Swiss Line products: expensive, but you can instantly see smoothing results. There are many restaurants and bars here, but we loved The Spice which juts dramatically over the cliff face like a Bond villain’s lair and serves a huge range of Asian-inspired dishes, which you can see being cooked in the open kitchen. We shared deliciously-fresh Sushi, followed by Pad Thai and glass noodles. Our favourite was the Middle Eastern Sharq restaurant, which had a more funky, friendly vibe – we loved their hot and cold mezze dishes so much, we kept going back for more. The tennis courts are works of art: intricate wooden-beamed domes with glass walls framing the mountains. There is also a golf course, skating/curling rink, hiking and biking trails and a private lido on the lake. Modernist design, inspiring scenery, a variety of food and a perfectly thoughtout spa. 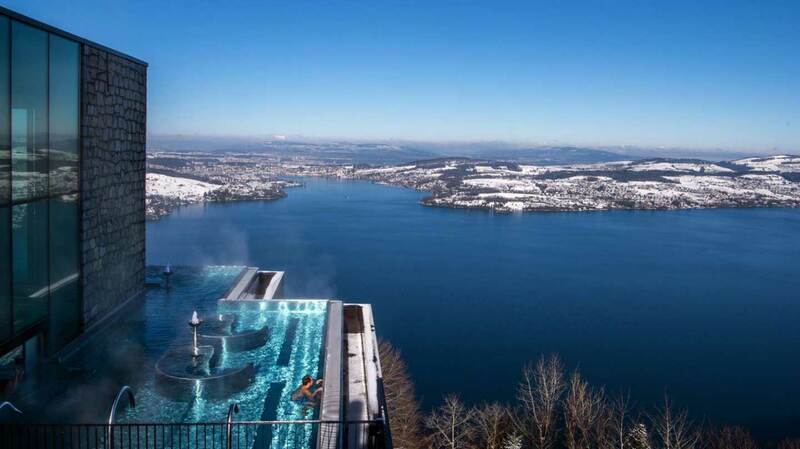 If we won the lottery, we would totally do 'an Audrey' and make the Bürgenstock our home.